This incredible recipe was submitted by one of our Facebook Fans, Ryan D.! Thank you Ryan! They are delicious AND nutritious! Use a 9 x 13 inch glass dish or pan. Add all of the ingredients together in a large mixing bowl. (Easier if the sunflower seed butter is warm and pliable). Mix ingredients with electric mixer or by hand. Press mixture into pan and place in fridge. Keep in the fridge for at least an hour or overnight. 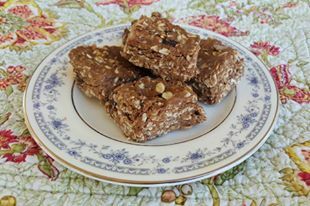 Remove from fridge and cut to desired size bars. – Serve and enjoy!